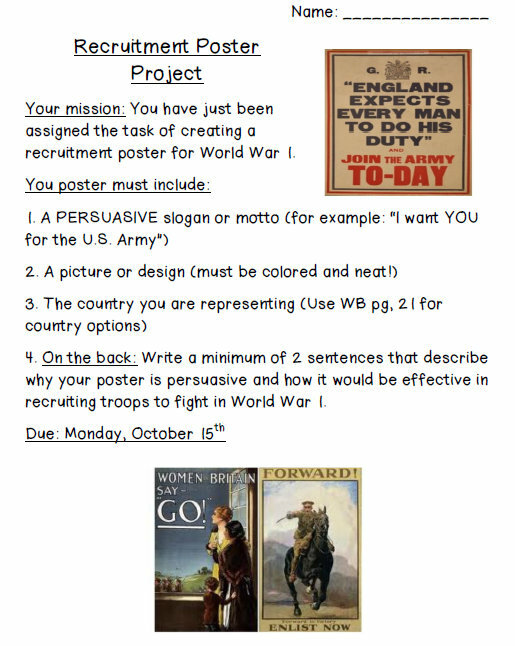 We Want YOU to Join WW1! Our class has been studying World War 1 in class and the students are loving it! I love to see them (especially the boys) so eager to open their history books. We've been discussing the various countries involved, the causes of the war, and important battles in the war. One thing we really emphasize is the emotions that are raging during a war - the emotions of the countries involved, the officers, the enlisted soldiers, and the people left at home. One place where emotions run high are during recruitment campaigns to get men to join the armed forces. 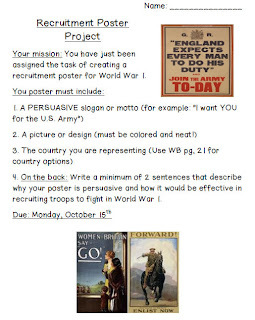 To further our discussion of recruitment posters and persuasive techniques,my partner, Rose Loiacono, and I have the students a special assignment. They had to choose a country to represent, come up with a persuasive slogan, and then design and decorate a recruitment poster. They did a phenomenal job! Fun Friday and Pintrest Reorganization! Tell Me Something Good Linky! My First Year of Teaching SCRAPBOOK! Keeping Parents "In the Loop"